The end of last week I attended the Stampin’ Up! OnStage event in Salt Lake City where demonstrators from around the world gathered to stamp, be inspired and celebrate our accomplishments. Thank you for your support, your Stampin’ Up! orders and the sweet emails you send me telling me you like the cards I’ve shared. YOU are the reason I’m here. Not only was I #8 in the US, but I was #18 in the WORLD! There are over 48,000 demonstrators worldwide so… Wow. Just Wow. 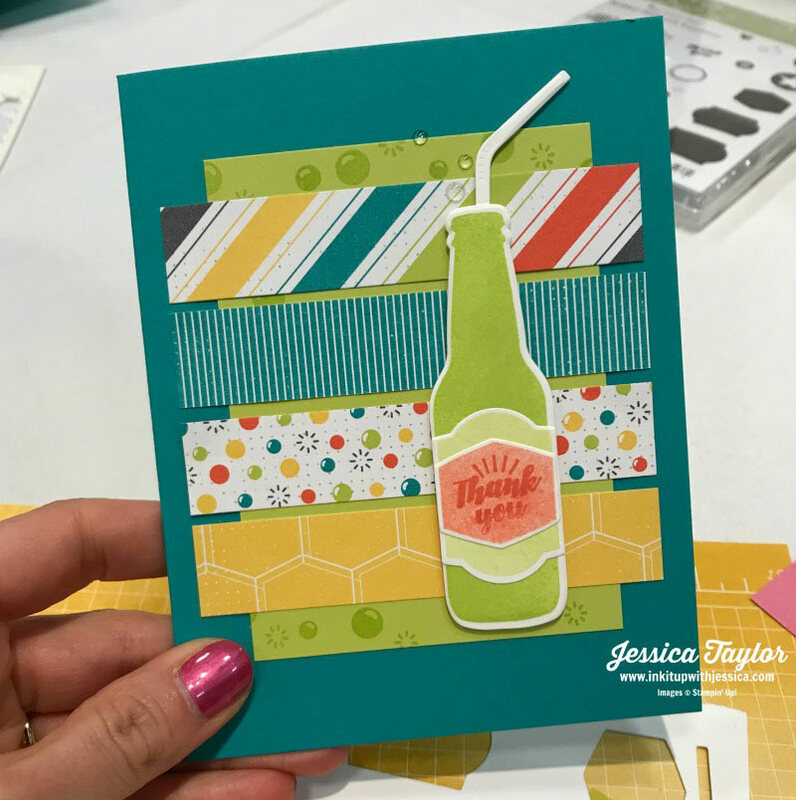 This Soda Pop Thank You card was my favorite make and take. It uses all new stamps and paper that won’t be available for awhile yet but you can use the fun layout with papers that you already have. Just cut some pretty patterned papers into 3/4″ x 3-3/4″ strips. This might be a great way to use up some of your pretty paper scraps! The light green paper behind the pretty paper strips is 3″ x 4″ for those of you that like measurements. You can give people all the same supplies and they still end up with different cards. I’m not even sure what the original make and takes were supposed to look like but here are the cards that were made by my friends Kelly and Becky, with mine in the middle. I’m sure you’re not surprised to see that mine is the most basic. If you look closely you can see that we colored some of the flowers on the black & white paper. Just dip the tip of a blender pen into the ink in the lid of the ink pad and use it to quickly add some color. Do you have any paper you could try this on? I’ve got lots more to share, but now that I’m back home there’s no room service and my family seems to want dinner. Go figure! Thank you again for being a part of my stamping journey and sharing in my joy & excitement. Ah ! that’s so nice to hear!! Congratulations! you should be very proud. wow – quite an achievement that you so richly deserve. You are a great teacher and love your site although I must admit I have been lurking around without commenting for awhile. I am one of those that said I wouldn’t couldn’t do a card because I am not creative. Now 6 years later and because of sites like yours, I can proudly make cards for my family who appreciate my cards. Thanks for sharing your knowledge and Kudos once again! Hi Lillian, I am so happy that you can proudly make cards now!! Thank you for sharing.